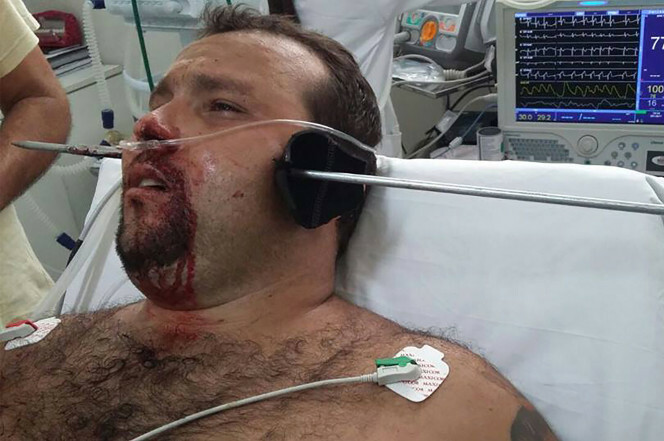 In an unbelievable and horrifying incident a fisherman in Brazil was harpooned through his face in a photo that has gone viral. The image reportedly from the Military Fire Brigade of Minas Gerais near Araguari where the man was fishing, shows 27-year-old Hugo Pereira da Silva with a spear through what appears to be just forward of his temple. The man appears to be stable, though in obvious shock. Doctors said the harpoon was inches away from piercing his brain and causing death, but as it was the spear was removed and the man was released from the hospital with a painful wound and a hell of a story.